The high-tech nature of the pool is due not only to the custom engineering but also to the liberal use of products from Pentair, High-Tech’s preferred provider. Some two decades after High-Tech Pools, Inc., had been passed over for a contract to create a backyard swimming pool in Hunting Valley, Ohio, the homeowner reappeared with a request: Redo the job that the winning, lower-bidding company had ended up botching so long ago. Owner and operations manager Jerry Hammerschmidt dispatched the person who had bid on the job the first time — the company’s president and lead salesman, his father Jeff, who has been in the pool-building business since 1958. It was clear right away that the pool would need to be rebuilt almost from scratch. The High-Tech team created a sleek, geometric design of adjoining rectangles divided by under-lit concrete stepping stones that lead to a spectacular cabana, which was designed and renovated by a separate firm. The pool is lined with blue-glass Daltile tile, which lends it a striking hue that is further enhanced by the extensive underwater Pentair IntelliBrite and GloBrite lighting. One end features a diving board inset into the pool on stone blocks and flanked by tile-lined tree planters with scupper weirs. The high-tech nature of the pool is due not only to the custom engineering but also to the liberal use of products from Pentair, High-Tech’s preferred provider. Pentair provided the pool’s lighting, interior finish, sanitizer, cleaner, circulation, and automation. The company’s ScreenLogic interface system allows the homeowner to regulate all elements of the pool via an in-home controller or a smartphone. “We choose Pentair because extensive relationship with them, the quality of their products, our status as a Pentair warranty center, and due to their extended warranty,” says Jerry. The pool’s most ambitious and attractive element is a 360-degree acrylic vanishing-edge attached spa. The effect — of a raised glass box seeming to float in the middle of the aquamarine swimming pool — delivers exactly that look of artistic modernity the client was looking for. The spa was particularly challenging to design because in Ohio regulations prohibit the pool and the spa from sharing the same water. 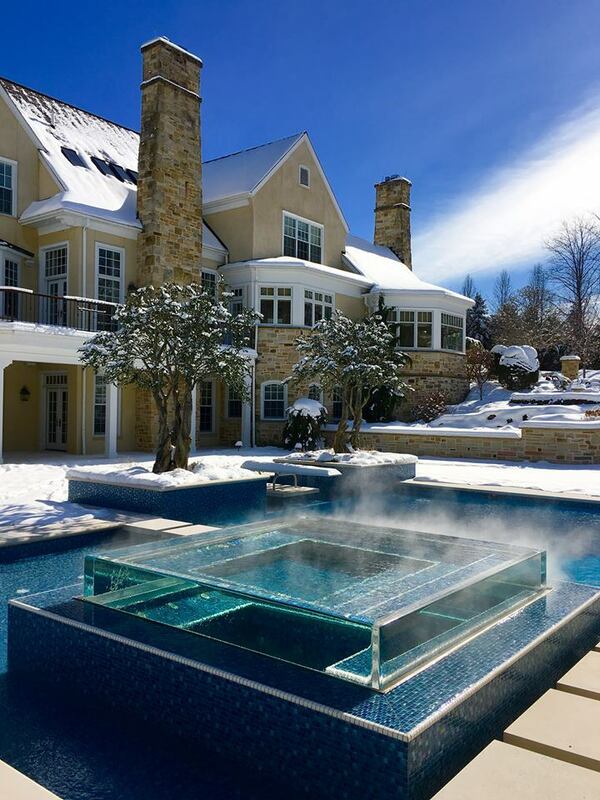 The Hammerschmidt team designed a stainless-steel trough to wrap around the acrylic spa so its water could be diverted from the larger pool. This was a novel design for the team; to get it right they created a full-sized mock-up in their warehouse to make sure it would work as needed. The fit had to be exact to maintain the sleek appearance of the spa while ensuring proper hydraulic engineering. Pulling off this feat drew the notice of the pool-building community, garnering High-Tech an APSP International Award of Excellence in Gold and an Attached Spa Award in Gold from the Master Pool Guild. The pool was even featured on the Master Pool Guild’s Christmas card. From the noteworthy see-through spa to the azure tile to the handy automation system, this pool has made High-Tech’s client very glad he finally said yes to their bid, even if 20 years later than he wishes he had. The Hammerschmidts are no strangers to ambitious design and high-tech engineering, but combining technical challenge with artistry makes for a special kind of professional satisfaction.